Size: 1917 sq.ft. - 2253 sq.ft. Villanova Community is welcoming a new and the third Phase of Amaranta in Dubailand. With the victorious response for Phase 1 & Phase 2 the Dubai Properties is launching this 3rd phase in the same healthy space Villas & Townhouses community. The Phase 3 is being created on an 18,000 square meters of lush green landscapes with the view of beautiful gardens outside. The Villanova Amaranta Phase 3 houses too many choices for you to pick from. 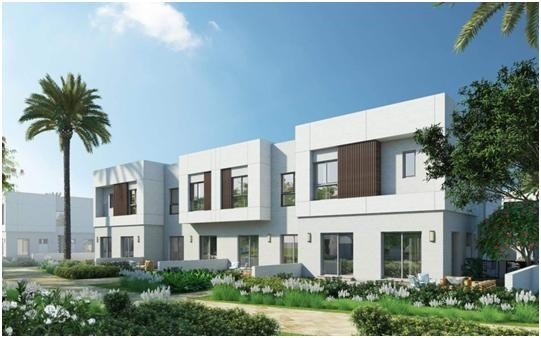 The structure of Amaranta Phase 3 holds two types of designs of 3 BR & 4 BR Townhouses.The costs of these Townhouses are AED 1,400,000 and the handover date is finalized by the Quarter4 of 2020. Amaranta Phase 3 floor plans are configured with the layouts of 2 floors townhouses. Living in Villanova community is like you are getting charmed towards a relaxed and strain free lifestyle. This community homes are not large in Bedroom sizes but also has separate area/space for Maids room, Storage, Laundry and Garage and the same pattern has been followed by all the townhouses. 3 Bed houses come in the range of 1917 Sq.ft to 1939 Sq.ft while 4 Bed townhouses ranging from 2253 Sq.ft. This phase is home to 300 families with common space in each villas and townhouses. The elegancy and exterior finishes is inspired by Spanish home designs with radiant natural hues. Dubai's top real estate group "Dubai Properties" was founded in 2002 and is headquartered in Dubai, UAE. Dubai Properties main work is to design the development of Residential, Commercial & Retail properties. With 16 years of experience they are known to be one of the versatile groups amongst all other construction companies. Their great success was after the launch of world's mega single phase Jumeirah Beach Residence (JBR) residential property. After this residential structure the company keep growing their portfolio with dubai's luxurious projects in the most preferred destination where the portfolio covers Al Waha, Casadora, Arabella, Arabella Phase - 2, The Villa, Ghoroob, Layan, Manazel Al Khor, Dubai Wharf at Culture Village, 1/JBR at JBR, The Executive Towers and Vision Tower at Business Bay, Mudon, Remraam, Serena, Bay Avenue, Bay Square and Bellevue Towers. Amaranta Townhouses are on the south east location of Villanova in Dubailand. Villanova community is set within the serene place that is very appealing to the home buyers and investors. Amaranta Phase 3 is surrounded by the master plan like La Quinta and Amaranta Phase 1 & 2. The Villanova also compromises of other residential properties and recreational centres such as Dubai Silicon Oasis, Academic City, Dubai outlet Mall, DLRC and Global Village. These projects (Amaranta 1 & 2 Phases and La Quinta) in Villanova consists of 3 BR, 4 BR & 5 BR Standalone Villas and Townhouses. Dubai International Academic City, Al Maktoum International Airport, the Expo 2020 site and Business Bay - city's prominent business and leisure district falls at 30 Minutes distance from the community. Other social infrastructures like Schools – GEMS First Point School & The Indian International School, Hospitals – Symbiosis Medical Centre and Mediclinic in Arabian Ranches, Shopping Malls – Al Barsha Mall and Al Quoz Mall and many other destinations is in close proximity from the Amaranta residences. Amaranta Phase 3 is located at Dubai-bypass Road between Al Ain and Sheikh Mohammed Bin Zayed Road in Villanova Community, Dubailand, Dubai, UAE. Amaranta is featuring amenities that comfort people of all ages with offerings like Private Parking for each villa, BBQ Cone, Picnic Zone, Swimming Pool, Kid’s Playground, Sport courts for all kind of Sports, Cycling Track, Running Track, Gymnasium, Community Mosque, tennis court, badminton court and more entertaining facilities.